A successful brewmaster’s course on crafting sour Belgian beers inspired Matt Potts, CEO and Brewmaster of DESTIHL Brewery, to develop a faster souring process to create the flavorful brews that helped DESTIHL grow just as fast. Fortunately, his local electric co-op provided support for his company’s most recent expansion that includes a $15-million 47,000-square-foot destination brewery and beer hall. The DESTIHL Brewery floor, where the company makes its beers. From when DESTIHL’s first location opened in 2007, Potts tasted success. 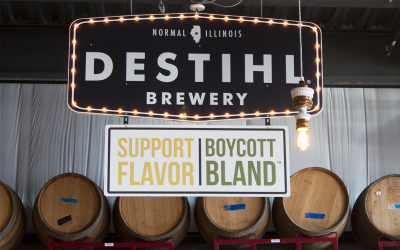 As the microbrew craze ballooned in the U.S., DESTIHL experienced unparalleled growth that led to a second location in 2011 and a third in 2013. The brewery then began selling its Wild Sour Series in cans in September 2014; demand grew so quickly that the microbrewery expanded its sales to 30 states. 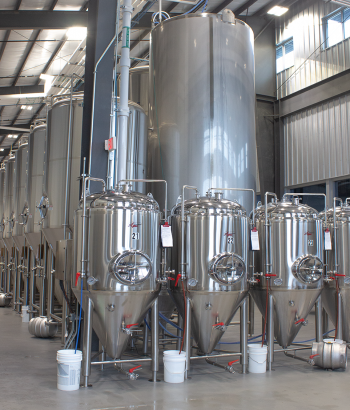 As demand grew, Potts realized that a new customized facility would best suit all of DESTIHL’s brewing needs. That was when he spotted the then-vacant location in Normal, Ill. It was near a commercial area, though undeveloped for the brewery to tailor to its needs. The town extended the roadway to get to the new location. Corn Belt Energy, the local electric cooperative that serves the site, installed new street lights. DESTIHL also collaborated with Corn Belt Energy and the rest of the Power Moves® team, which includes an engineer specializing in energy efficiency, on rebates for efficiency upgrades that save money on long-term energy costs. DESTIHL Brewery received Power Moves rebates for energy efficiency incentives that save money on long-term energy costs. DESTIHL’s upgrades include LEDs, which use less electricity and have a longer lifespan than incandescent lighting; and energy-saving variable frequency drives on motors used in the brewing and canning process. Energy efficient coolers and freezers also were installed. The Power Moves team awarded DESTIHL with a $25,000 rebate for the upgrades, which will save $20,000 in annual energy costs. Potts continues to keep his eyes on the future and opportunities for growth. The new location on a major interstate also lends itself well to the brewery’s growing popularity. And in early 2018, DESTIHL shipped beer to South Korea, DESTIHL’s first international market.